Alexandra Ovtchinnikova has completed her BA degree in Set and Costume Design at Cambridge College of Art, UK and her MA in Costume Design at Aalto University, Finland. 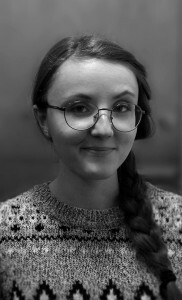 She is currently a doctoral candidate at Aalto University, Department of Film, Television and Scenography and an active member of the Costume in Focus research group. She has diverse experience in design, production, and styling for performance (dance, theatre, film etc.) in Bulgaria, Finland and the UK. Her doctoral research reflects her interests in the nature of poetic cinema and costume as one of its elements and in the development of new practice-based methodologies for researching costume design in film. Research Statement: Alexandra Ovtchinnikova´s research explores the functions of costume in the films of four directors of the Soviet Poetic School: Sergei Parajanov, Andrei Tarkovsky, Yuri Ilyenko and Tengiz Abuladze. It examines the ways in which costume contributes to the fabrication of the purely mental reconstruction of the mythical universe on the basis of a historical and ethnographic reality in their films. The research highlights the key learnings from a historically significant period in the Soviet cinema (1960s -1980s) which was often defined by the tendency to link national particularity with stylistic experimentation. It demonstrates that costume can be used not only as a device to support the storytelling and make the cinematic experience comfortable, but also as a poetic device that helps create a challenging journey for the viewer’s perception while retaining its dramaturgical qualities. The methods of the study are designed to provide valuable insight into the viability of the hybrid approach of art and practice in academia, and how these angles can be leveraged to expand and enhance future studies. By employing the set of methodologies that are both academically and artistically grounded, Alexandra attempts to reflect upon the functions costume attains within the cinema of poetry.